Palace Resorts offers FREE WEDDING PACKAGES. Let Mexico Vacations and Travel book your Free Destination Beach Wedding at Moon Palace, Aventura Spa Palace, Cozumel Palace or Vallarta Palace. In addition, Palace Resorts offers some of the best Destination Wedding packages of any resort in Mexico! They are also one of the best resorts for Groups in Mexico! When booking a group at Palace, you can also receive Free Cocktail Parties, Free Reception Dinners and other free private functions! Book your Palace Resorts wedding package today with one of our Palace Resorts wedding specialist. Wedding package cost: Free **Some restrictions apply. Note: Package inclusions cannot be exchanged for additional services. Applies to USA and Mexico residents. Free wedding package must be reserved in advance at least 7 business days prior to arrival at the resort. 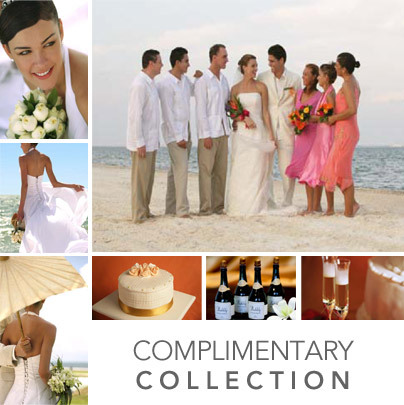 Weddings are only performed at Moon Palace Golf & Spa Resort, Aventura Spa Palace and Xpu-Ha Palace. • Honeymooners' weekly cocktail party with memento photograph for the couple. entire stay. Travel Agent, discounted or complementary stays do not qualify. Perfect. That’s how the most important day of your life should be. At Palace Resorts, it’s a memory we want you to hold onto forever. So our promise to you is to make your wedding a joyous celebration of wonderfully unforgettable moments. With every detail carefully planned and beautifully played out, your day truly is a dream come true. Start today by clicking here to download a wedding reservation form. Complimentary - With everything taken care of, you're free to enjoy your most memorable day. From your own dedicated wedding planner to a complimentary honeymoon package of continued bliss, your Palace Resorts wedding is picture-perfect in every way. All eyes are on you for your anticipated arrival. Crystal vases with amber gems lead you down the aisle as friends and loved ones share in your unbridled happiness. Then with the pronouncement of your marital bond, fireworks commence the celebration. This is your day to enjoy. Personal "My Palace Weddings Website"
Some of these images include the upgraded items which are not included in the "Wedding Collection". Please contact your wedding coordinator for pricing and more detailed information. 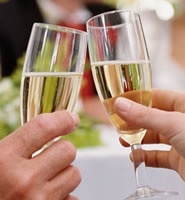 * An additional fee applies to all civil ceremonies. The perfect beachfront location is prepared for you arrival with hydrangeas and flowers to match your brilliant sapphire bouquet. Your guests look on with admiration and joy from rows of cobalt blue chairs as you make your entrance. And from your arrival to a honeymoon package that starts with breakfast in bed the morning after, it's a day like no other we bring to life for you. Cast against a sea of brilliant blue, the radiant ruby glow of your ceremony washes over you in a contagious wave of joyous bliss that carries over to friends and loved ones sharing in your happiness. Sparkling gems illuminate your entrance while delicate ginger and anthurium flowers lead you down the aisle to your most cherished day. Elegance and passion combine in an inviting array of fuchsia and dusty pink dendrobium orchids to accentuate our Amethyst Rose inspired compilation. From the entrance draped in amethyst purple satin to onyx stones escorting you down the aisle, exquisite style is the hallmark of your day. Softly waving in a gentle ocean breeze, peridot green satin inspires an enchanting palette of emerald hues that highlight your bridal bouquet and carry through to the river rocks and green cymbidium orchids highlighting your march to the alter. Then as the soloist accompanies your walk back down the aisle as on fireworks make it official. Unique by design, our diamond collection is a luminous arrangement of style and grace. White avant-garde chairs are draped in silver satin leading you down the aisle lined with crystal vases accented in diamond gems and filled with white phalaenopsis orchids. And as you step out of your horse drawn carriage and begin your march you realize, this is what dreams are made of.